The annual pilgramage to CES this year created quite an impression. The big themes were relentless connectivity and tracking, the concept of the Internet of Everything from Cisco, basically the intersection of humans, objects and technology and finally wearable technology. These themes provided us with huge opportunity and some not inconsiderable challenges as humans, businesses and marketeers. This year felt a little like companies were connecting things just because they could; objects were transmitting data, even though they did not know what to do with it. As a marketeer you were left scratching your head, knowing that somewhere in all this incredible innovation there was opportunity, but just did not know where to start. Even as a self proclaimed tech enthusiast I was still overwhelmed by the range of companies that want you to invest from both a money and time perspective in their ecosystems. Although the end result could sometimes be fantastic, such as the house you could entirely control from your phone, the lack of cross system interoperability leaves you wondering if we will be able to cope with the plethora of apps needed to manage all this and whether it will be safe, especially as regards the connected home. So all that said, I wanted to have a look at some of those big themes and try to eek out the challenges and opportunities for us all whether as a connected consumer or a business trying to benefit from it. CES looks to the future, identifies innovation and on that basis we should embrace all it has to offer us. At the same time it leaves the head spinning, trying to understand how to manage the plethora of ecosystems. Even as things stand we are all coping with the battle of the operating systems, more and more we are being encouraged to package our lives into Apple,Android or Microsoft. Just looking at the art of watching TV we are provided endless choice on how and where to watch content. Roku, Netflix, smart TVs, Apple TV, Chromecast and on and on, but after a few days here you realise that there is more to come, a lot more. The connected home has allowed companies such as LG, Samsung, ADT, DISH and others to offer the ability to hook up your whole house all the devices talking together. The problem is none of these systems are talking to each other, they are building closed systems. Yes it is incredibly clever but this has to work for us and has to have an element of open source wiring so we can consolidate different streams of data and functionality. Interestingly, companies such as Cisco and Intel may hold the key as they create smaller, faster chips that can go in multiple devices they may help us join the dots a little and perhaps find ways of at least consolidating data into a single dashboard. Apart from complexity of devices and systems there is also a cost perspective, how many different 200 pound devices and systems can we sustain? Just because you can does not always mean you should. It feels at CES that the technology is coming first and the consumer second in some regards. 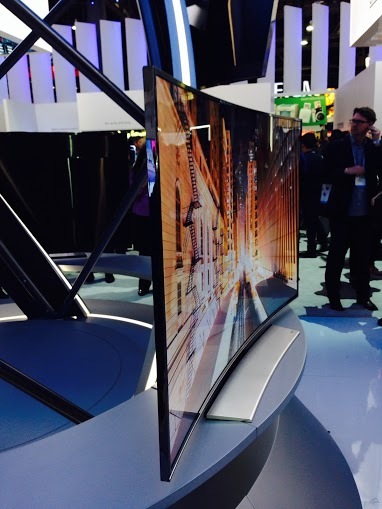 Let’s take the amazing 4K televisions with this year’s big twist – the introduction of curved screens. People were left a little cold by curved sceens, an innovation that lacked a real consumer demand and required a change in our approach to viewing. The suggestion from excitable sales people was that even on an 80-inch TV you need to sit close to it to enjoy it. That fails on a number of levels – not least big TVs go in big rooms and you dont want to be crowded around a TV like you are warming yourself around a fire. Secondly, I don’t want my kids sat on top of a massive screen. The other relatively important area is that none of the broadcasters have any content that is delivered in 4k. Instead of enhancing, sometimes the viewing experience is diminished – even on good old HD we still don’t have all content delivered in this fashion, so pretty as they were, I would not rush out and buy one. Similarly with features such as iBeacon from Apple – the idea that you can be fired messages from retailers and merchants as you browse stores sounds great but first you have to download an app from that retailer to be able to receive the messages. I for one do not want 50 Apps on my phone dedicated to retailers, as well as one for the Samsung fridge, cooker, the one for my BMW i3 outside and another for my ADT home security set up. Some how we need to link this together and make it user friendly and applicable. Data is a word that comes with a very wide remit, but one thing is for sure, we are creating it at a horrifying rate. Wearable technology, the smart home, the Internet of Everything, means this is both a positive and a negative for us all to consider. Imagine sensors on your body or clothes sending data to your health provider, your home consumption data being linked directly to retail stores, home utilities controlling themselves based on weather data, traffic data giving you immediate ways to avoid the latest gridlock. The opportunities are endless. Individuals become nodes on the internet transmitting data constantly to the internet. Much as we focus on the devices, let’s not forget we are being tracked. We will be tracked in every way possible and we have to make our peace with that. The best example of this was ‘Mother’, an object that sits at home and comes with many small sensors called cookies. You place these cookies anywhere you want to understand what is happening around your home – how often and long are you brushing your teeth, footfall through the door, how much coffee are you drinking… the list is endless. Those cookies then relay all this data back to Mother for you to analyse it. As with many things at CES, there seems to be a lack of clarity on exactly how this will all help, tracking for tracking sake. But at the end what we are doing is passing incredible amounts of data to third party companies. This data is becoming ever more intimate and needs to be carefully controlled. The most important area is the ability to decide what happens to that data – many of the devices do not allow you the opportunity to influence what is happening with it as it gets passed to the company servers. One commentator at CES also pointed out the fact that even among family members or flatmates there should be the ability to have more ownership of your information and set it apart from that of others in the family or home, again something not possible right now. As with all Wi-Fi data services the final consideration is the ability of hackers and tech thieves to access sensitive data from your life, or indeed in the case of the connected home, be able to easily hack into your ecosystem. These are all solvable issues and should in no way slow progress but as individuals we need to take control and encourage these companies we are entrusting our lives with to help us do that. As I toured the conference floor and we explored all these opportunities I was with a number of advertisers who were expressing their clear concern about how this was going to impact them. We already talk a lot about story telling and content. The proliferation of personal devices and tracking technologies means that each one of these companies – whether it is LG, BMW, Samsung – are all going to want to create their own ways of allowing advertisers to engage with people. Native advertising is a hot topic but will become increasingly relevant, bringing complexity to marketing and advertising as they have to work across a multitude of different ecosystems and platforms. We already mentioned the iBeacon technology; how will BMW or Audi want to deliver messaging in car to their passengers? The upside for large advertisers is that the more forward thinking may have an opportunity to work directly with tech partners higher up the food chain and scope how they can be integrated closely into this development. But all that requires time, people, cost and the old methods of advertising will become evermore distant, increasing pressure on wholesale reinvention. The tight rope they will need to walk will be avoiding too much disruption or even intrusion in the consumer’s experience. Tempting as it will be to use the incredible amounts of data available, people will be wary of that and given the intimacy of some of this data will expect it to be treated with respect. CES is not about advertising but we are reaching a crossroads where marketing and technology will need to work closely together. It currently resides a firm second to technological advancement from a utilitarian perspective. It does however promise much for marketeers as long as they realise more than ever they will need to deliver value. Value can come in many guises, but if you want me to download your app then I need something for that because there will be significant competition. The big standout this year was the rise of technology in the car. A flurry of launches at CES shows that this event is becoming very popular for car manufacturuers. There seems to be two directions manufacturers are moving in: the open platform based on Android or Apple where your car and phones are linked or proprietory technologies in the cars such as Audi that will turn your car into an intelligent hub. The car becomes the brain, it is able to make decisions based on commands and external data. As an example you could look up directions in the house and send them to the car, the car automatically plots that route using latest data and finds you an optimum route. Perhaps you are heading to a meeting and the car realises you are going to be late so it emails your meeting organiser with your current telemetry showing where you are and how far to go with an ETA. Since your journey will now be forever linked to the wider net, showing you relevant ads, perhaps for the next coffee house, petrol station or relevant shops to you based on previous journeys will be common place. Cars will also become social – with linkages between you and your friends as we see with recommendations – if you travel to a new town for example your friends recommendations can be presented to you – or even their route for getting there. The opportunities are endless and we will see the car completing the triangle between you, your home and your car. The final frontier is of course the self-driving car. All we have seen in this space has been the Google work but then up pops Audi and explains they have a self driving car up to 40mph, legal in Nevada. When did that happen? Well it has and even more than that it can find you a parking space, park it for you and if you want you can programme it to avoid red lights by adjusting its speed based on the traffic light data base that it has connected. As we mentioned earlier though that comes with limitations, not least you may find yourself driving very slowly as it seeks to avoid the next red light. I would suggest this is not for driving fans. Some of this connectivity will be useful though as you can start your car from the comfort of your own home and in winter make sure the windows are defrosted and the seats nice and warm as well as wider beenfits, I can see that being a winner for sure and with some clear upsides for advertisers. An incredible array of innovation, fantastic product explosion, and an inevitable and unstoppable march towards the Internet of Everything. As marketeers we will have to develop an incredibly open mind to reaching consumers. We will look to these companies to be guardians of our data using the highest level of integrity. As humans we are going to be linked inexoribly to the cloud and as Cisco say ‘be nodes’ of the Internet through our connected homes, cars and objects. There is so much to work out, but the future is exciting and we should embrace it. as with increasing consumer downloads your business will also grow rapidly.